A third family, the Sabines, plays a key part in Gardley’s (re-)imagining: Alsendra, Artez, and Benevolence Sabine, played respectively by Dawn L. Troupe, Michael Gene Sullivan, and Safiya Fredericks. Ulysses encounters them early on his attempted journey home, where they’re on a New Orleans rooftop to escape the rising tides. Tides of Hurricane Katrina, tides of racism, tides of history, and tides of memory. Benevolence joins Ulysses for much of his journey home, and the Odyssey episodes weave in and out of their own adventures as well as the hero’s storytelling. Two such episodes were particularly spectacular: the Sirens episode, which gives Thompson a chance to play a pimped-out Granddaddy Tiresias, Troupe to play Diana Ross, Hall to do Tina Turner, and Sullivan to tear up the trunktop of a gold Caddy convertible as James Brown. Even better (and “better” is a relative word amidst such strong ensemble performances) is Troupe’s performance as Calypso, who tempts Ulysses with a monologue about food that had the audience salivating as she caresses every sound and syllable. Gardley’s script is as lyric as anything I’ve ever heard or read, and I have read and heard a lot of song and poetry. (I cannot wait to re-read it in print, so if you’re a publisher, hurry and snap up the rights–no, the privileges–to publish this play.) There’s rhyme and rhythm, music and musings, imagery and idea to spare that not only honor the original; they take the original and this, its variation, further into the realm of timelessness. And the production honors every word. The simple yet stunning set design by Michael Locher consists of a grid of white-gold square pillars of varying heights. Xavier Pierce’s illuminations, darknesses, and shadows and Carlis Roberts’s sounds and silences transform them from the realm of the gods to project hallways and from BART and police stations. And because Ulysses Lincoln mentions that he enlisted in the military post-9/11, I thought more than once of the ruins of the World Trade Center. At the climax of the play–a deeply moving encounter between Ulysses and one of his female ancestors that reminded me of a moment in the great Toni Morrison’s Beloved–one of the pillars pivots around to spectacular effect. 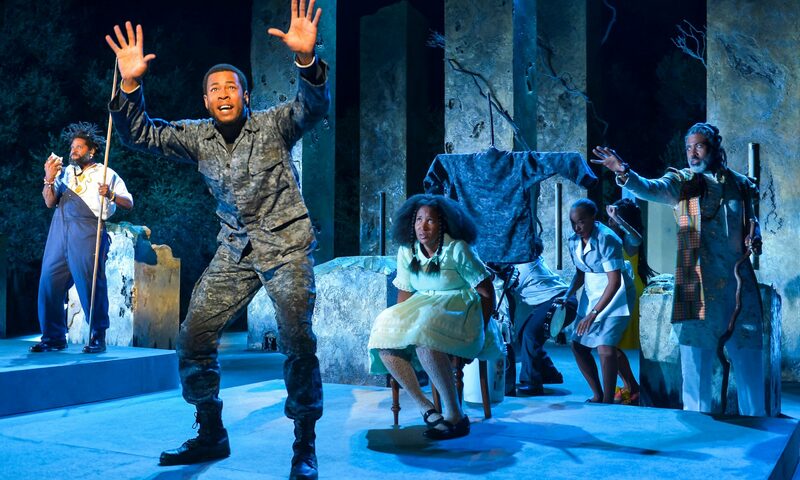 Gardley’s play sings a song of society and selfhood, but more importantly, it gathers up humanity, history, memory, and storytelling into one magnificent performance poem. I haven’t seen Parks’s version of the Homeric myth, so I can’t compare them, and I don’t think I’d have to. black odyssey is a collective and collected chorus that rings true and necessary for our moment, and for moments to come. We too have a long journey to make, a long homecoming path to trod to get to the America we seem to be on the verge of losing. black odyssey is an imaginative roadmap for the heroism we’ll need.